She is feisty and she's back. Jayalalithaa Jayaram, the 'Iron Lady' from Poes Garden, has bucked the trend to beat anti-incumbency and retain power in Tamil Nadu -- a first since 1984.Indeed, the 68-year-old politician is "a phenomenon" in the state, as political commentator Cho Ramasawamy puts it. From being a shy, young girl to the chair of chief minister of one of India's biggest states, Jayalalithaa certainly knows what it takes to negotiate the roller coaster ride. Born in Karnataka on February 2, 1948 into an Iyengar family and named Komavalli, Jayalalithaa moved to Chennai in the 1950s to live with her mother who worked as an actress on stage and Tamil films. A bright student, Jayalalithaa studied at the Bishop Cotton Girl's High School in Bengaluru. After her relocation to Chennai, she studied at the Church Park Presentation Convent.At age 16, Jayalalithaa acted in a Kannada movie which turned out to be a blockbuster. She also acted on stage for several years even as she continued to study. Even though she wanted to pursue higher studies, Jayalalithaa gradually veered towards acting. Her first Tamil movie was "Vennira Aadai" (1965). Over the decades she acted in 140 films in Tamil, Telugu and Kannada and even one in Hindi ("Izzat") opposite Dharmendra. But her acting career skyrocketed after she was paired with legendary M.G. Ramachandran (MGR). The success of the film "Aayirathil Oruvan" (1965) turned Jayalalithaa into a leading heroine in Tamil movies.It is widely believed that it was MGR who prompted Jalaylalithaa to join politics. But in reality, Jayalalithaa made her own choice. It's a fact that MGR did appoint her as the propaganda secretary of AIADMK. But it was because of her own grit and capacity that Jayalalithaa, a Brahmin in the Dravidian party, could move her way up in the outfit. She was elected to the Rajya Sabha in 1984 and retained her seat till 1989. By then, her mentor MGR was dead. In 1989, she was elected to the Tamil Nadu assembly for the first time. She served as the Leader of Opposition, the first woman to hold that position. Yes, there was vitriolic opposition to Jayalalithaa's ascendancy in Tamil politics, especially from the DMK of M. Karunanidhi. But she countered all that.Two years later, in 1991, she became chief minister of the state in alliance with the Congress, riding on the sympathy wave following Rajiv Gandhi's assassination at an election rally near Chennai. Jalayalithaa became chief minister in 1991, 2001, 2002 (by-election), 2011 and 2015 (by-election). She has been in and out of power several times, battling incumbency and corruption charges. But she never gave up. A charismatic leader who is at home in Tamil, English and Hindi -- a rare quality in Tamil Nadu politics, Jayalalithaa has also recorded many songs and written several stories.But even as Jayalalithaa takes over as Tamil Nadu chief minister once again, she will have to face the disproportionate assets case against which the Karnataka government has appealed in the Supreme Court. She was acquitted in the case by the Karnataka High Court, but with the matter pending before the apex court, Jayalalithaa will surely remain a bit uneasy. 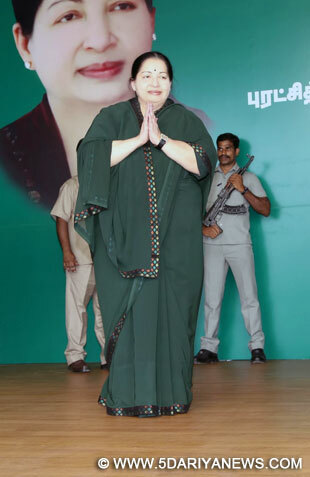 However, for the time being she would feel relaxed, with Tamil Nadu's electorate giving her one more chance to govern the sprawling southern state.